Well, almost. The fridge isn’t actually included in the sale. 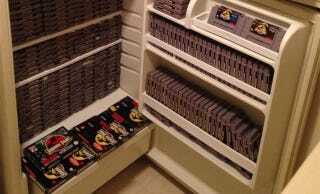 But over 300 video games—mostly copies of Jurassic Park for the Super Nintendo—are. Jurassic Park on the SNES was a masterpiece, combining Zelda-like overworld gameplay with interior sections that switched to FPS. In 2012 I had an opportunity to buy out a portion of a game store. It was there in the basement of this old store that I had the opportunity to purchase a number of Jurassic Park carts i.e. 120ish. I said, “why not, that could be fun”. I posted the haul on NintendoAge, and goodness, did things escalate quick. Soon I had 200, then 250, and now right around 300. I traded people for them, did some auctions where members bid using jurassic park games as currency, and some kind guys and gals even donated to the cause. There is no reason per say as to why sell them now. I have had a lot of fun with them, and this is an opportunity for me to share the fun I’ve had. It’s also an opportunity for me to possibly pass the torch so another can share the fun and maybe add to it. If any soul dares that is! Note that this isn’t an auction; it’s $1500 buy it now. Sadly, the Bacardi isn’t included either.